One of the newest Catrice products that I have been most excited to try is the new Liquid Camouflage High Coverage Concealers. I'm a long time fan of the Camouflage Cream concealer pots and I really strongly hope that these are not being discontinued now that the liquid versions have been introduced. There are a pretty dismal 2 shades available only, and I picked up both. Both shades are very pale - 010 Porcellain is a very pale, neutral shade, whereas 020 Light Beige is also pale but more yellow. 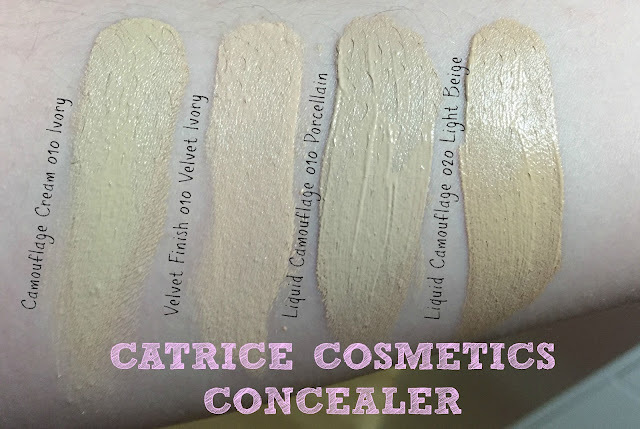 I love Catrice but the shade range across the concealers and foundations is very limited to various shades of pale. Whilst I am pretty pale (MAC NW20 for your reference), I would say that 010 is extremely pale, I prefer to use this for brightening instead of concealing blemishes. As the winter months draw in, this may change somewhat. 020 is a better shade for concealing blemishes in my mind- however, when patted with my ring finger, I found that this colour oxidised horrifically on my skin and looks really yellow, even when I applied foundation over the top of it. Catrice promise a high coverage and ultra-longlasting concealer that perfectly camouflages undereye circles, spots and even tattoos. That is quite the promise! Now I cannot attest to the tattoo coverage claims, the high coverage and longevity of this concealer are noteworthy in my opinion. This is easy enough to apply but when it dries, it absolutely sets down and DOES NOT BUDGE. For that reason, I recommend working quickly with this and pat or blend it as soon as you apply it instead of leaving it dry. 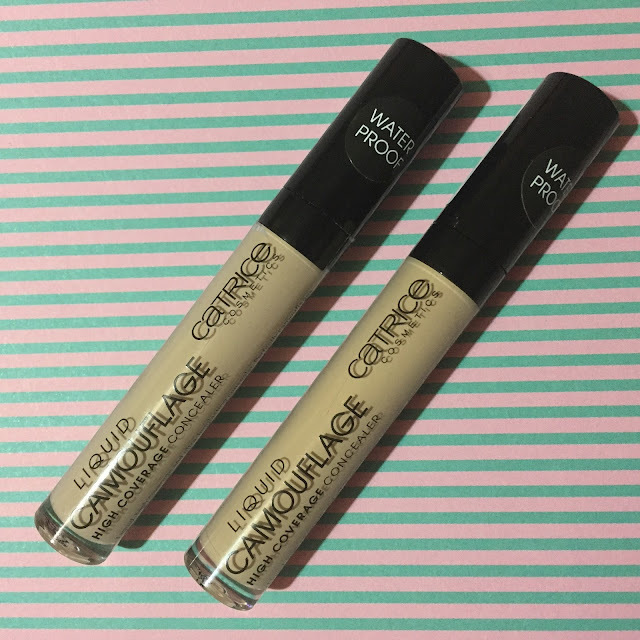 The consistency of the Liquid Camouflage concealer is very creamy but quite thick but can be warmed and loosened a little by patting it with your finger. They are also very buildable should you find that one layer doesn't give you enough coverage. Also this could quite an effective undereye concealer, but definitely keep it away from any fine lines. Catrice also claim that this is waterproof and even though I have not submerged my head in water to test this claim, I have gotten caught in those sporadic rain showers and sweated in this blistering heat (sorry for the mental imagery) and concealer has stayed in tact. It actually really lasts. Now- back to the colour point- as is the case with so many brands, there is no consistency between the shades across different foundations or concealers in the same brand. In the picture above, I compared four concealers - having picked up the lightest shade in the first three (Camouflage Cream 010 Ivory, Velvet Finish Concealer 010 Velvet Ivory and Liquid Camouflage Concealer in 010 Porcellain) and you can see the differ in terms of shade and tone. 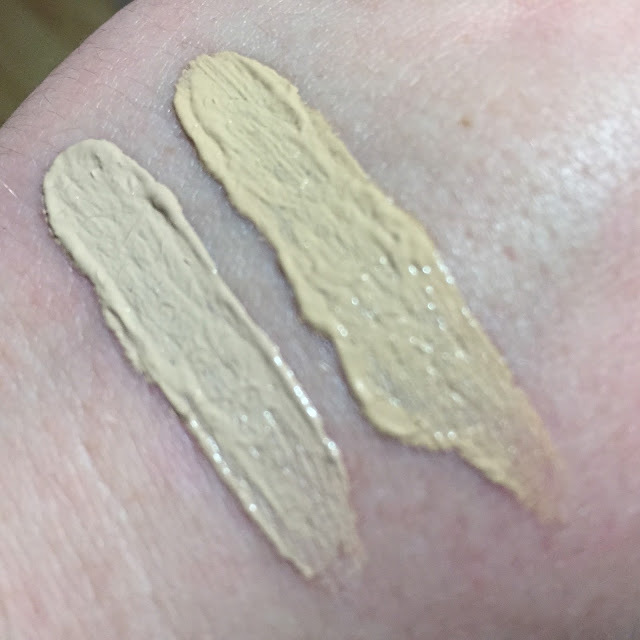 I also compared the second Liquid Camouflage Concealer in 020 Light Beige on the right so you can see how dark it is in comparison to the others. I believe these cost €3.79 a piece and you get a very respectable 5ml of product in each. The packaging is sleek and sturdy- I really rate Catrice packaging- I find it's almost always simplistic and chic looking. There is a doe foot applicator to apply the product with. I quite like these- I do think they are very full coverage and I will probably use them up. I can't compare these to any other concealers on the market as I don't think there is anything else quite like these. I've heard another blogger compare these to the Urban Decay Naked Skin Concealer- but to be honest, I think they are quite different. In my opinion, the coverage of the Urban Decay one was a fraction less than the Catrice offering, probably because the actually formula/texture of the cream was a little lighter. They would be more like first cousins than sisters, but definitely share a gene pool somewhere along the line. I can see how people would think this is too thick, too dry, and I can also see how people will think this is the best thing since that auld sliced pan we all know and love. I straddle both camps- it's not my favourite concealer ever but I respect that it is might and, even with the little price tag, if you can get a colour to suit you, I think you would be hard pushed to find a concealer that performs as well as this one does. Have you tried out this concealer yet or is it on your wishlist? I picked one up two weeks ago and love it. I love the fact that it really lasts and that it can be used to cover dark circles and any blemishes - I do agree that you need to work fast with it. 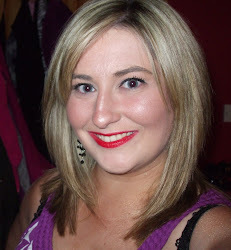 I find the darker shade works well for me and thankfully haven't had any issues with oxidisation! I do wish that they had a better shade selection. I really like this, the palest shade is a great match on me and it really wears well throughout the day!